Want to experience firsthand what we do at IISD Experimental Lakes Area? Want to expose your students to freshwater research? 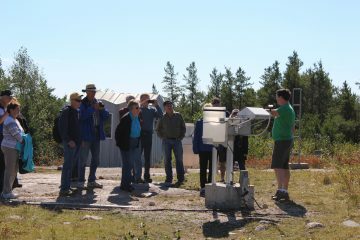 We are pleased to offer group tours for the general public and school groups, as well as overnight stays to high school and university students during our field season (May to October)! Visits can be adapted for a variety of audiences and are aimed at informing everyone about this world-class facility, exposing students to a hands-on field experience and complementing school curriculum. Tours are typically 3–4 hours in length (including lunch); the length of overnight stays are based on the school’s interest. Tour participants are required to bring a lunch and appropriate clothing for the season. Overnight visitors will be provided with a list of supplies needed. IISD-ELA can accommodate various curriculum and course goals. Overnight stays can be geared towards students participating in field experience and/or completing independent projects (independent projects can meet the International Baccalaureate requirements for biology, chemistry and physics). Please contact us at education@iisd-ela.org with questions or to organize a tour or overnight stay.